The gastrointestinal (GI) tract is the largest immune organ in the body. There is a large and diverse population of GI bacteria that influences the health in many ways. A healthy level of good bacteria is not only necessary for maintaining the function of the gastrointestinal tract but also to keep the immune system strong and promote overall wellness. When the balance of intestinal flora is disrupted by excessive bad bacteria, this can cause GI tract problems and reduce your dog’s resistance to diseases. Probiotics are live micro-organisms, when administered in adequate amounts, provide a health benefit to the host. Probiotics that have been clinically tested are Lactobacillus species, Bifidobacterium species, Enterococcus faecium and Saccharomyces boulardii (yeast). There are many factors that can cause improper balance of intestinal microflora. They include dietary changes, stress, old age, weaning, travel, boarding, antibiotics and steroids. When your dog’s intestinal tract is overloaded with bad bacteria, this can result in diarrhea, poor nutrient absorption, allergies, autoimmune disease and other health problems. Supplementing with probiotics can help to restore the ratio of good to bad bacteria in your dog’s system. 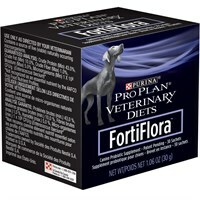 Fortiflora Canine is a probiotic supplement for dogs. It has been clinically shown to increase beneficial bacteria, reduce potential pathogens, improve stool quaity, stabilise intestinal flora and enhance faecal IgA production in puppies and elderly dogs.